The Hornets were put to the sword by a rampant Reds side, but Gracia has defended his players and insists they are already focused on returning to winning ways. Watford head coach Javi Gracia remains confident in his players despite enduring a 5-0 thumping by title-chasers Liverpool, and has assured fans that he and his squad are determined to get back to winning ways with the visit of Leicester City on Sunday. Early goals from Sadio Mané separated the sides at half-time, but the scoreline at the break arguably flattered the Hornets who never truly discovered any rhythm throughout the game. After the restart, a deft finish from Divock Origi preceded a rare brace for commanding centre-back Virgil van Dijk, sending the visitors whimpering back to Hertfordshire. “After we conceded one early goal, it was very difficult for us to compete,” admitted an uncharacteristically downbeat Gracia. The scoreline tells the tale of what many may interpret as an embarrassing, even humiliating defeat for Watford — but it’s important to bear in mind the sheer quality of their opposition on the night. Mané’s outrageous back-heel for the second goal was a spectacular manifestation of the swagger with which Liverpool are currently playing, and no matter how much application the Hornets afforded, they were powerless to resist a ruthless Reds side. Gracia chose to highlight Liverpool’s wide players and subsequent goal threats as the reason why they were so uncontainable — indeed, full-backs Andy Robertson and Trent Alexander-Arnold notched two and three assists respectively, giving forwards Mane and Origi, and even centre-half van Dijk, adequate chances to show their goalscoring prowess. However, considering the potency of the opposition, Gracia will avoid harsh treatment of his players despite the resounding loss. That’s understandable — in the last 14 league games, the Hornets have lost just four, all at the hands of teams in the top six, and have not been defeated by a side outside of that bracket since 1st December. The loss sees Watford drop one position to 8th, with goal difference providing the separation between them and fellow contenders for the final Europa League spot, Wolverhampton Wanderers. Nevertheless, the Hornets remain firmly in the top half, and Gracia reinstated that the bigger picture is more important than a single result by highlighting the success he and his side have enjoyed so far in this campaign. Sunday presents a good opportunity for the Hornets to get back to winning ways with a crucial tie against Leicester. The Foxes parted ways with Claude Puel on Monday after a poor run of form, but are still in the running for European qualification with new manager Brendan Rodgers at the helm. 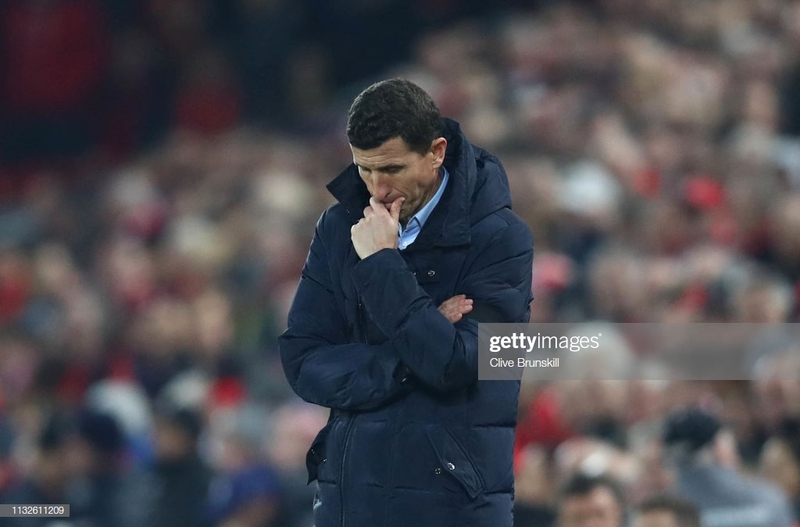 And Gracia asserts that Watford will not dwell on a humbling result on Merseyside — their attention has already turned to the weekend’s challenge. “We carry on this week to be focused on the next game. We have very good players, we have a very good squad and we will continue playing in the same way we have done.